Margaret Littman is both an old-timer and a relative newcomer to Nashville. After graduating from Vanderbilt University, she left Tennessee for points north over the course of her writing career. But after 17 years away she could no longer resist the siren song of the Parthenon, bluegrass music, or fried pickles, so she returned to Nashville. In the last eight years she's gotten to know her new home again. From here she writes about Southeast travel, food, pets, startup businesses and more, but her favorite thing to show people the Music City she loves. 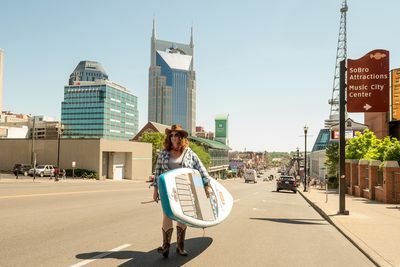 Since moving to Music City she has acquired a 1967 Ford pickup and a lot of pairs of boots, but still not the ability to carry a tune. Margaret is never bored at work. Or anywhere else for that matter. Her writing appears in a cross-section of national magazines, websites and for book publishers, including Rolling Stone Country, USA Today, Nashville Lifestyles, Entrepreneur and many others. She is the author of Moon Nashville and Moon Tennessee guidebooks and is at work on Moon Nashville to New Orleans, a road trip to the amazing 444-mile Natchez Trace. Margaret has a B.A. in fine arts from Vanderbilt University and an M.S.J. from the Medill School of Journalism at Northwestern University. The Art of Risk author Kayt Sukel comes to Parnassus Books.